The River Lethe was one of the rivers of Hades in Greek mythology. Exposure to its waters was held to lead to loss of memory, or, more intriguingly, a state of "unmindfulness" and oblivion. From this origin, it has re-appeared throughout western culture, from Dante to Tony Banks's first solo album (River Lethe in popular culture, Wikipedia). By providing the alternative spelling of Leith, Alasdair Roberts 'doubles' this meaning with the Water of Leith, a river that runs through Edinburgh, and co-locates ancient Greek and contemporary Scots mythology. The idea of eternal return is bound up with memory, with cultures being compelled to repeat and confront the missteps of the past. So the oblivion of forgetfulness provided by the endless Lethe provides a form of antidote or escape. The concept of eternal return has a chequered history through philosophy and culture, but Alasdair Roberts is invoking the particular use of the term by the religious historian Mircea Eliade. The Wikipedia entry) says that Eliade's eternal return is "a belief, expressed... in religious behaviour, in the ability to return to the mythical age, to become contemporary with the events described in one's myths". Thus, through the medium of song, we are taken back to become contemporary with, among other things, the Crusades and the falls of Jericho and of Babylon. the first song in some ways explores the idea of “eternal return” – I was reading Mircea Eliade on the subject, and Nietzsche obviously wrote about it – I became obsessed with the idea and the various ways in which it could be configured. 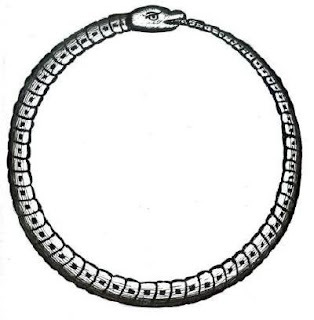 There’s obviously the classic image of the ouroboros serpent… but I was also think about it in terms of the myth of progress – when what we think of as progress is actually destruction. Like Kekulé’s ring, Benzene. And the fact that I personally constantly return to Song as a form of “expression” or creation rather than, say, improvisation or composition. Chamber lye was urine collected from chamber pots, used for stain removal and pre-wash soaking, and also for removal of natural oils from wool, and set dyes, not to mention its many uses in medicine (source). They buried her in the old churchyard, <br> And William was buried beside her. <br> From Barbara's grave grew a red red rose. <br> From William's a green briar. They grew to the top of the old church wall, <br> 'Til they could grow no higher. <br> They wrapped and entwined in a lover's knot, <br> The rose around the briar. Hamish Henderson finished this poem in 1963, having drawn on an anonymous German poem he had seen in 1939. Referring to the melody that he composed in order for it to be performed as a song, he stated: "[it] somewhat resembles the 'urlar' (or 'ground') of a pibroch". The poem was first published in 'The Scottish Broadsheet' (May, 1963).